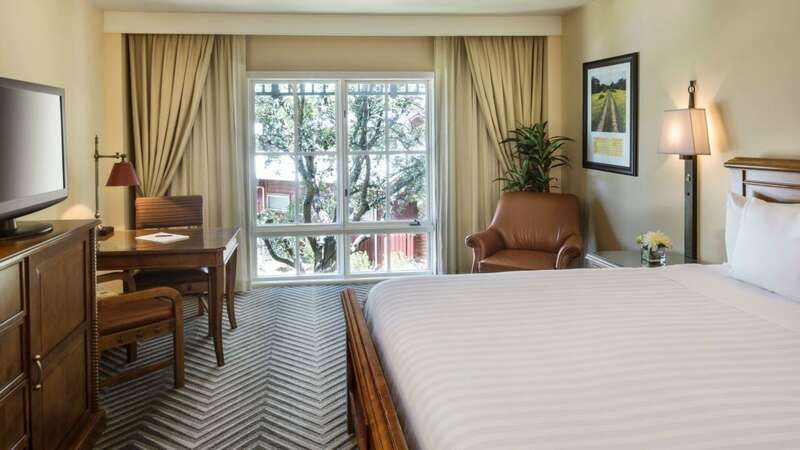 Hyatt Regency Hill Country Resort and Spa features elegant hotel rooms in San Antonio designed for the ultimate relaxation getaway or business retreat. The inviting and comfortably stylish décor at our Texas Hill Country resort complement the spectacular scenery while leaving our guests feeling pampered and rejuvenated. All of our guestrooms include pillow top Hyatt Grand Beds®, mini refrigerators and free Internet. Upgrade to a suite for extra space and comfort or enjoy gorgeous views of the countryside landscape from your private patio or balcony room. These spacious 1,699 sq ft suites include a large living and dining area complete with wet bar, kitchenette, direct balcony access and a master king bedroom with luxurious elevated Jacuzzi tub and walk-in marble shower. One bedroom suite sleeps up to 5 people with rollaway beds. Add an adjoining guestroom for 2,091 sq ft of total space. Two bedroom suite with adjoining room can sleep up to a total of 9 people. This is a premium suite. See World of Hyatt program terms for upgrade eligibility. These spacious suites include a 619 sq ft parlor, complete with large living and dining area, wet bar, mini-refrigerator, full-bathroom, pull-out sleeper sofa and direct balcony access. The parlor connects to one or two of our 392 sq ft guestrooms with additional bathroom and standard resort amenities. Parlor area can sleep up to 4 people with rollaway beds. Adjoining guestrooms sleep 2-4 people. Total occupancy; up to 10 people for parlor and two adjoining guestrooms. This is a premium suite. See World of Hyatt program terms for upgrade eligibility. 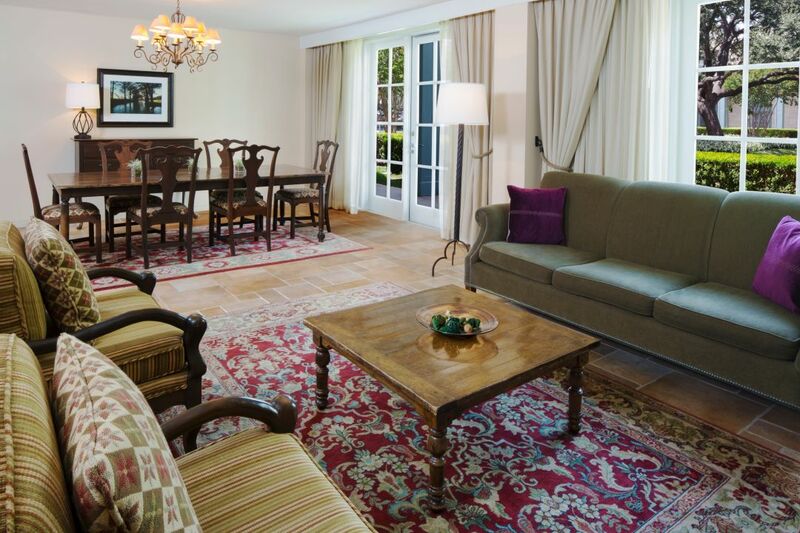 Experience our elegant and spacious Hospitality Suites, which boast a 753 sq ft parlor, complete with murphy bed, large living and dining area, wet bar, microwave, mini-refrigerator, full-bathroom, and floor-to-ceiling windows and patio doors with direct access to resort grounds. Parlor area can sleep up to 4 people with rollaway beds. Adjoining 392 sq ft king or double guestroom sleeps 2-4 people. Total occupancy; up to 8 people for parlor and adjoining guestroom. This is a premium suite. See World of Hyatt program terms for upgrade eligibility. 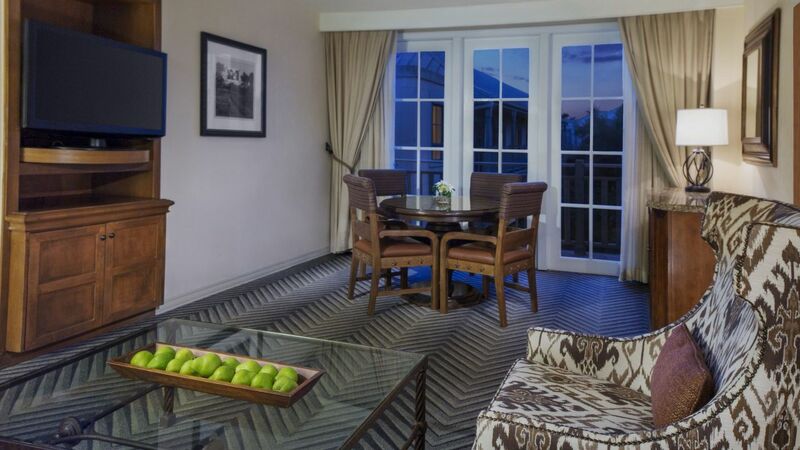 Enjoy the extra space and casual elegance of our one and two-bedroom Hill Country Suites. Complete with private king bedroom, full-size sofa bed, large living area and dining table, the 599 sq ft one-bedroom suites sleep 4 and 991 sq ft two-bedroom suites with adjoining room sleep up to 8. This is a standard suite. See World of Hyatt program terms for upgrade eligibility. 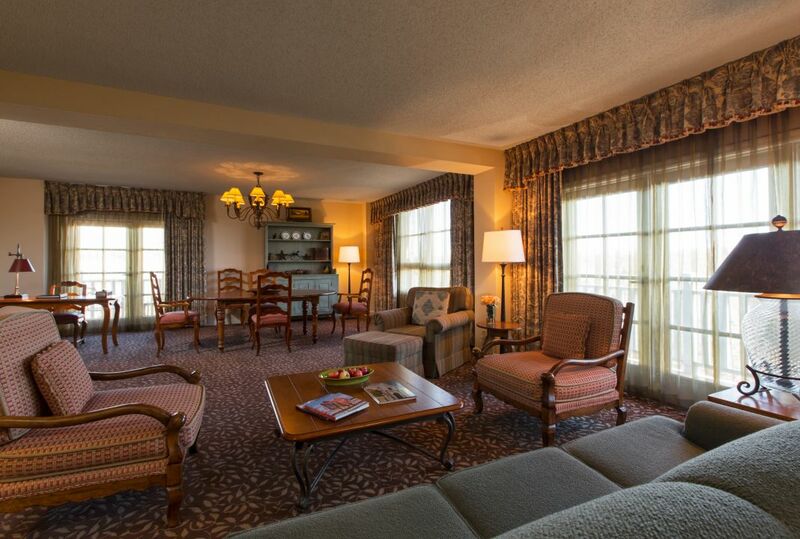 To book a two-bedroom suite, check availability and then select “2 Bedroom Suites." These popular first-floor guestrooms offer 392 sq ft of space, a king bed, and convenient, direct access to our resort facilities and amenities via walk-out patio doors. These popular first-floor guestrooms offer 392 sq ft of space, two double beds, and convenient, direct access to our resort facilities and amenities via walk-out patio doors. Enjoy gorgeous Hill Country views from your own balcony in these 392 sq ft guestrooms featuring one king bed and charming Texas ranch décor. 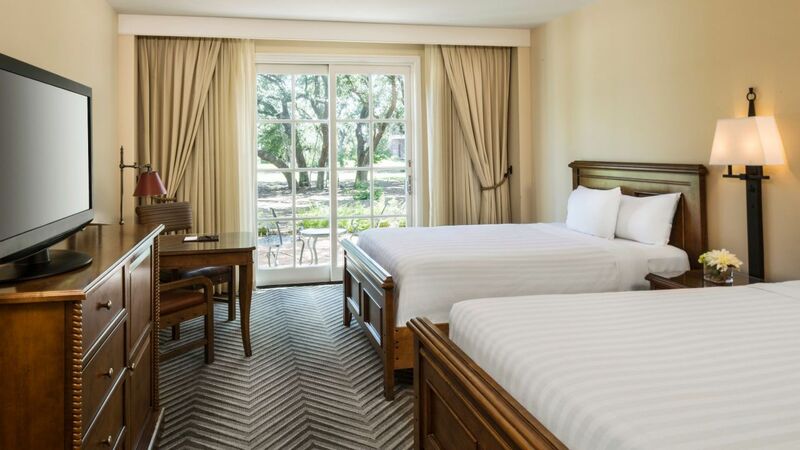 Enjoy gorgeous Hill Country views from your own balcony in these 392 sq ft guestrooms featuring two double beds and charming Texas ranch décor. 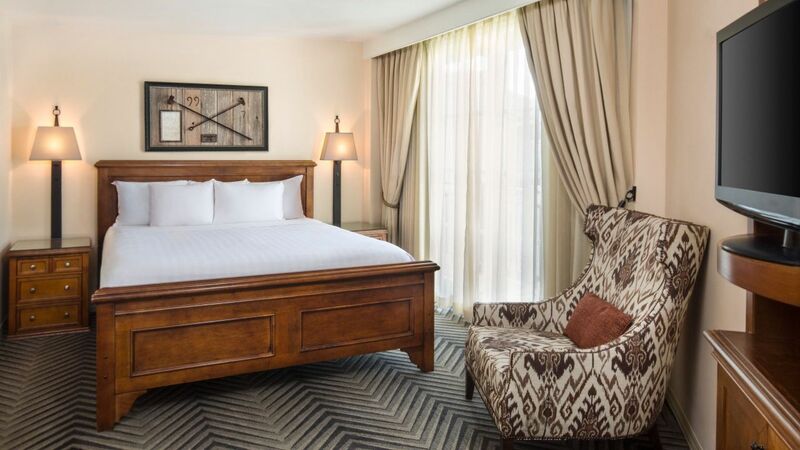 Relax in 392 sq ft of comfortable elegance featuring one king bed and charming ranch décor with local Texan artwork and historic heirlooms. Relax in 392 sq ft of comfortable elegance featuring two double beds and charming ranch décor with local Texan artwork and historic heirlooms. Relax in 392 sq ft of comfortable elegance with one king bed and fully accessible features, including a roll-in shower and more. Relax in 392 sq ft of comfortable elegance with two double beds and fully accessible features, including a roll-in shower and more.